This absolutely gorgeous image from the European Southern Observatory reveals a planetary nebula, the short-lived phenomenon between the death of a star and birth of a white dwarf that has nothing to do with planets. We recently discussed the peculiar nomenclature of planetary nebulae, so let's just focus on the general awesomeness of this image, which was taken by the VISTA telescope at the Paranal Observatory in Chile. 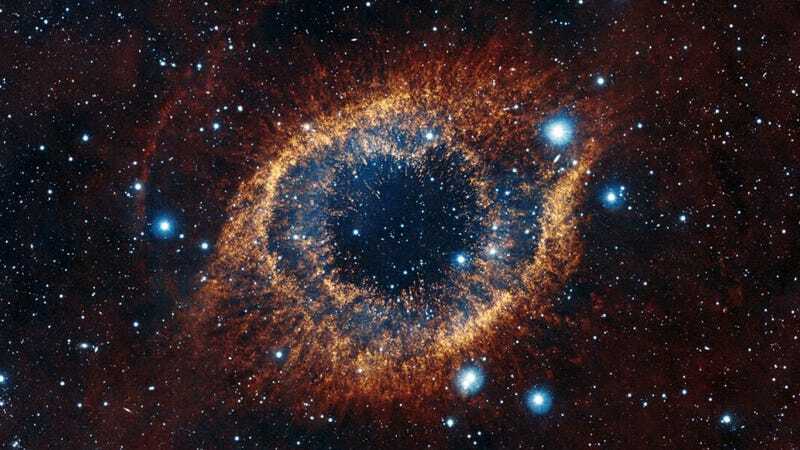 The Helix Nebula is located about 700 light-years from Earth, and its scale is absolutely enormous, clocking it at over four light-years across. To put that in perspective, do you see each of those strands of hydrogen gas that make up the nebula's ring? Yeah...each of those is the size of our solar system. Stare into the eerie heart of the Little Ghost Nebula...if you dare! The nebula itself is a complex object composed of dust, ionised material as well as molecular gas, arrayed in a beautiful and intricate flower-like pattern and glowing in the fierce glare of ultraviolet light from the central hot star. The main ring of the Helix is about two light-years across, roughly half the distance between the Sun and the nearest star. However, material from the nebula spreads out from the star to at least four light-years. This is particularly clear in this infrared view since red molecular gas can be seen across much of the image. While hard to see visually, the glow from the thinly spread gas is easily captured by VISTA's special detectors, which are very sensitive to infrared light. The 4.1-metre telescope is also able to detect an impressive array of background stars and galaxies. The powerful vision of ESO's VISTA telescope also reveals fine structure in the nebula's rings. The infrared light picks out how the cooler, molecular gas is organised. The material clumps into filaments that radiate out from the centre and the whole view resembles a celestial firework display. For more, check out the ESO's website.